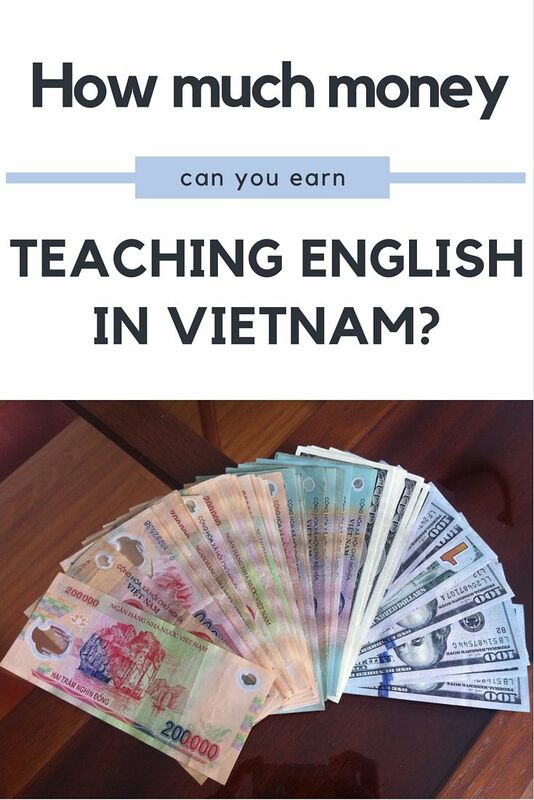 19 Apr How Much Money Can you Earn from Teaching in Vietnam? We’ve spent the last few weeks trying to transfer the bulk of our hard-earned teaching dollars safely back to the UK. After four trips to Vietcom bank, multiple phone calls to our English bank and the help of a Vietnamese colleague to translate, we heaved a huge sigh of relief when the money finally landed in our account. That is, until we saw that we’d lost £300 in the hefty exchange rate. Oh, and we still have another instalment to transfer next month but hey, we’re halfway there! We’ve provided information in this post about how much we’ve earned and saved during nine months of teaching in Hanoi, Vietnam. So, if you’ve been wondering where to teach in Asia or how to save up some cash fairly quickly, perhaps this will help you make a decision. We moved to Vietnam to earn back the money we’d spent during the first year and a half of our travels. Although we’d researched where to teach in Asia, Vietnam was a bit of a gamble as it’s not a very common teaching destination. I’d say that the gamble paid off as high wages and demand for English teachers, combined with a low cost of living, has allowed us to meet our savings target. We are extremely lucky to earn a high wage in Hanoi; after tax, Andrew earns $23 per hour and I earn $22. Our working hours throughout the academic year have fluctuated due to schedule changes and personal preferences; at one point I was working 22 hours a week but exhausted, I’ve now dropped down to around 15. Andrew’s hours have varied from 19 per week to as much as 26. This sounds pretty measly, especially when compared to the 40 hour work-weeks I was used to in London, but it feels like we’re working much more than we are here because our hours are so spread out. Our longest day is from 8am till 8.30pm but we actually only teach for a three-hour block in the morning, two hours in the afternoon and three hours in the evening. We also have to add in time to lesson plan and gather resources on a weekly basis. Although we live far more extravagantly here than we did in London, as our living cost breakdown shows, we spend on average just £700 to £800 a month. We have a lovely apartment, eat out regularly, get weekly massages and take trips away whenever we can. Dinner for two in one of our favourite restaurants, including drinks and dessert, comes to less than £10. Our apartment costs just £280 a month to rent and transport in the form of our motorbike rental, petrol and taxi trips cost around £60 a month. We pay approximately £30 a month for electricity, which sounds high but we’ve had to run either the heating or air conditioning on a regular basis. How Much Money have we Saved in Vietnam? We still have two pay checks left to collect, but we are finally able to calculate exactly how much money we will have saved after nine months of teaching and living in Vietnam. While we haven’t earned a spectacularly high amount per person (the table lists figures for two people), we have managed to save over two-thirds of our income due to the low living costs in Vietnam. We will combine this money with the savings we already have in the UK to fund our future travels. 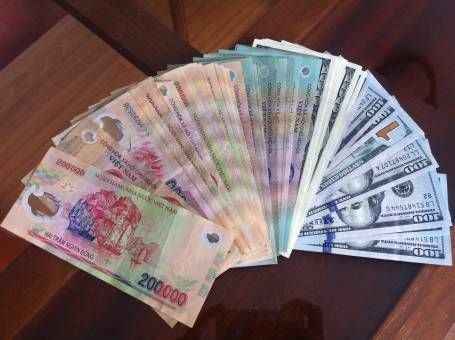 The money was earned by two people over nine months from September to May, following the Vietnamese academic year. We are paid for teaching through a combination of US dollars and Vietnamese Dong; the Dollars went into a savings account with Vietcom bank and Dong was used for daily living costs. It cost us £35 in fees to transfer money back to the UK and high exchange rates mean that we ended up with slightly less in our UK savings accounts than we’d anticipated. We have big plans for our savings; in just seven weeks’ time we leave Vietnam and head for a three-week holiday to Thailand before flying back to the UK for a summer break. A large chunk of our savings will go towards a highly-anticipated three-month trip to America in the autumn. After spending December back in England we will be heading to Europe – exciting times ahead! Well done – you guys did so well to save that much. Helps the USD is worth a bunch more in GBP than it was a few months ago too I bet. Who did you use to transfer cash? We’ve used transferwise and tranzfers but that was for more common countries (gbp, usd, cad, nzd etc) – guessing transferring from Vietnam is quite a lot harder! We simply transferred the money with our Vietnamese bank, I don’t think Transferwise can help us in Vietnam. There’s a lot of red tape involved here. We are planning to get to HCM mid April and eventually Hanoi in early May. I have a bad feeling we might just miss you. Hi Stefan, we’re leaving Hanoi on the 5th June so hopefully you’ll make it here before then? It’s exciting to hear that you might be teaching somewhere in Asia, if you like Vietnam it’s definitely worth considering working here. Thank you for this article. My girlfriend and i are looking at doing this in around 12-18 months time. Simply amazing that you managed to save that amount of money. We’re a little bit confused by the table, it looks like you spent less than 700-800 pound a month as some months look as low as 300 pound spent when your accomodation was 280 pound a month. Were you using personal savings or have we misinterpreted the data? We definately see you as role models and hope to achieve everything you have. Thanks so much for the kind offer Gilda, I will let you know if we’re in Dorset 🙂 When I think back to my first few classes I realise just how much I’ve learnt in such a short space of time. Fantastic achievement guys – you are amazing at saving!! Very excited to read about your future travels. We’re back in the UK in the summer too – if you find yourselves in the Northwest it would be nice to meet! Thanks Katie, it is pretty easy to save money here in Hanoi though 🙂 Exciting news that you are also returning to the UK, I’ll let you know if we’re in the Northwest at all, it would be great to finally meet! GREAT post! I am so surprised to hear how much you can earn as a teacher; well done on the money saving! Amy I love that. I am in interested in the teaching. can you assist me in getting a place to teach? Hi Mike, are you in Hanoi at the moment? If so, send us an email through our contact form https://www.ourbigfattraveladventure.com/contact/ with your CV and we’ll see if we can put you in touch with our former language centre. True Jenia, the lesson panning and resource gathering process does bump up our working hours considerably. Luckily we don’t have any homework to mark though 🙂 When we first arrived here we intended to work 22 hours each per week for the entire academic year but we totally underestimated how tough that would be. We especially didn’t take into account how often we’d get sick or how exhausting it is to work in sweltering heat and humidity. Love your informative/helpful posts. I had no idea you could earn so much doing this. Have fun spending it, looking forward to hearing your next adventures! We will definitely have fun spending our hard-earned dollars 🙂 We’re really lucky to have been able to earn and save so much money here; the low living costs have made all the difference. It’s going to be a shock getting used to prices in the Europe and America! Congratulations Amy and Andrew! You are doing exactly what you set out to do, finding your path and making it work for you! You must really be looking forward to a vacation in Thailand and spending your summer back in the UK! So happy for you both! We are really looking forward to a break Patti! I’m also starting to research our trip to New England; it feels great to be planning a new trip! I just stumbled on your blog this morning, and this work day is in great danger of being less than productive….at least as far as my actual work is concerned! Thanks so much for this. I was really curious about the possibility of teaching English to rebuild my savings. Glad to see it’s completely doable – even if transferring money is a bit messier than we would like. Your trip to the US: are you going to make it to NYC? Hi Jen, thanks so much for reading and commenting. Teaching in Vietnam is definitely a good option if you’re looking to rebuild your savings and experience life in Asia. Are you seriously considering it? Yes, we will be in New York in November and we can’t wait! I was just wondering if you have done a TEFl course or anything? Hi Jessica, yes, I did a 120-hour online course plus a 20 hour practical course in London. Andrew didn’t take a course because he is a qualified, experienced teacher in the UK. Very inspiring post! I am thinking of doing the same as yourselves only I am always hesitating due to he fact i’m a bit shy. I’m worried I’ll make for a bad teacher. I even skipped presentation modules in college due to shyness. I suppose i’ll have to get over it eventually though. Would you recommend going for it? Hi Ronan, I’m not a very loud person and I don’t like public speaking so I was nervous about teaching too but teaching helped me to get over that. It took a while for me to get used to being the person at the front of the class in control, but it helped that the kids were fairly young, enthusiastic and keen to meet me – having a microphone helped too. I would definitely recommend going for it, you may feel a bit uncomfortable at first but it will quickly become easier and I’m sure you’ll have a great experience. Good luck, if you need any help or have any other questions, let me know. Thanks for the prompt response, very much appreciated! I think i’m just worried I’ll go into panic mode or not know what to say when i’m teaching the class (stumbling my words/mumbling etc). My savings account isn’t great at the moment so I could only afford the LoveTEFL course which sounds pretty in depth despite it being an online one. I’m in Australia on a working holiday now but the work situation isn’t great and its so expensive here! Added to that, it feels too much like home. I’ve felt for 2 years now that I’d love to teach English in Asia but never had the courage to just try it – instead ive been sticking to coming on holiday. Even if you do go into panic mode (that happened to me often!) the kids can’t usually tell, especially if they’re young, same goes for being shy. It sounds like primary would be a good start for you as the middle school kids Andrew taught could be much trickier; generally the younger kids I taught were lovely, the only problem I had was that it was noisy because the class sizes were so large. I would definitely recommend just booking a flight and going over, as long as you get there before the start of the school year in September you should have luck finding something. Where are you thinking of heading? If you get to Hanoi in Vietnam pretty quickly I reckon you’d be able to find work. If you are thinking of Hanoi, let us know and we can put you in touch with our old language centre. Thank you so much for posting all these amazing teaching in Vietnam resources! Seriously, they’ve been so helpful in deciding whether to move there or not when I could barely find any other information online. Hi Jade, thanks for reading and commenting 🙂 I’m glad you’ve found our posts useful and if you have any questions, let me know. Hello there, thank you so much for such a detailed report of your savings. Congrats on your achievements and Happy New Year! I taught in Malaysia last year and couldn’t save much because their taxes are at %25. Hi Marina, thanks for reading and commenting. Wow, that’s a high tax rate! I definitely loved Hanoi the most, which is why we chose to settle there, but it depends on what you like. Many people think HCMC is more modern and westernised, it’s also hot and humid all year round. Hanoi has seasons and is full of old colonial buildings and coffee shops, it has more ‘charm’, I’d say. I’d recommend travelling around the country to get a feel for the different places and see what suits you. Hi Amy, I’m currently living and teaching in Hanoi for a company called BME. I am working full time but have the evenings off and would like to use this time to bump up my pay. I was fascinated by your post and wonder if you could perhaps put me into contact with the language center you worked at. Or perhaps do you have any contacts for giving private English tuition in Hanoi? Hi Joe, thanks for reading and commenting. We worked for Washington Language Center, you can contact them if you’re interested in evening classes, they may have something available, try emailing re[email protected]. Good luck! Hi Tisa, I’m not sure why that has happened. If you send your CV through to our contact form, we’ll pass it onto the Director for you as we have her personal email address. 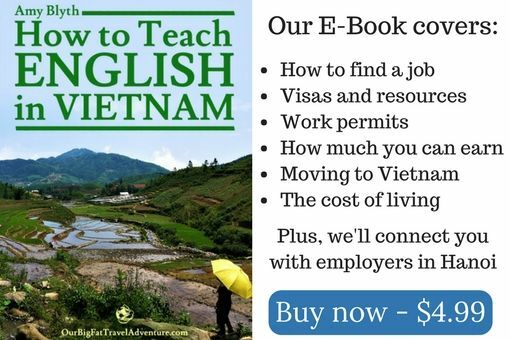 I’m looking to move to Vietnam in July and teach English so your blog has answered many question for me – and has definitely got me more fired up about going! I have just a couple of questions for you if I may? Firstly I am a fully qualified secondary teacher of Design and Technology with 2 years experience (post PGCE). Do you feel it is necessary for me to gain a TEFL qualification in addition to having QTS and teaching experience? Also, what is the best way for me to sort out accomodation do you think. I am a single traveller and would ideally like to live with other teachers if at all possible. Hi Helen, thanks for reading and commenting, I’m glad you’ve found our blog useful. 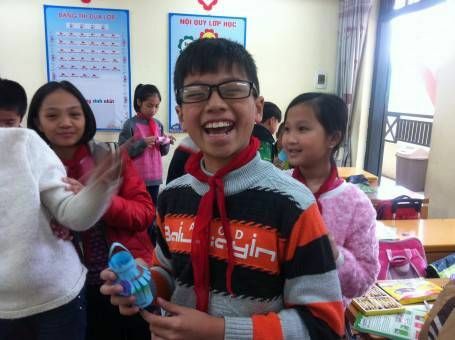 Andrew has QTS and got a job very easily in Vietnam without a TEFL qualification but the rules may be different now, so if you have time I’d recommend getting an online TEFL as well. As for accommodation, are you thinking of moving to Hanoi? If so, you might want to check out The New Hanoian to find rooms in shared houses; you can find similar websites like this for other areas of Vietnam. Your language centre might also be able to help you find accommodation. Good luck and if you have anymore questions, let me know! I don’t understand your earnings to savings calculation. Together you earned £1645 total the first month, then saved £1416? So your expenses were only £229? But on average you spent £750 per month? This is highly informative. I am Zimbabwean but would like to teach English in Vietnam. Thanks for reading and commenting, I’m glad you found our info useful. Good luck with everything in Vietnam! Hi Bessie, I’m really not sure about maths teaching in Vietnam. We only knew ESL teachers I’m afraid. However, I would say that you’d probably have to look for jobs at international schools though, so start by searching for schools in your preferred cities. International schools usually have job listings on their websites. If you have teaching status in your home country and are a native English speaker (or whatever language the international school requires) then you should be fine. Good Luck! Hi there, I am currently teaching in Vietnam now, mostly due to finding your blog. 🙂 How did you open a bank account here in Vietnam? And how do you transfer money home? The recruiter that helped me land my job said she could open an account for me under her name but that makes me nervous. Hi Maryjean, I hope you’re enjoying Vietnam! We used Vietcom bank and were able to open an account in our names easily. Our language centre helped us to fill in the forms, we had to supply our work contract and passport I think. Can you ask your employer to help with that? It should be pretty straight forward. We got our wages in cash and used to pay them in every month at the branch, then when we left they did an international money transfer to our UK account. There was a fee for this and again, we had to get a Vietnamese colleague to help us but it was fine. You do have to provide payslips whenever you transfer money or pay money into your account though to prove where the money has come from. I hope this helps! Yes, it is very helpful! Thank you so much. Love your blog! Thanks Maryjean 🙂 No worries, let me know if you have any other questions. How did you get your money out of Vietnam? I have a friend leaving and doesn’t have a contract. Did you ever hear how people get their money out? I don’t have a contract either so the info. would be helpful for when I leave as well. Hi Maryjean, we made a bank transfer from our Vietnamese account to our UK account, we did have to provide payslips to show where the money came from to be able to do this though. So, it may be tricky if you don’t have this proof. You can carry out a certain amount in cash (check government guidelines for how much) or try using a service like Western Union, but I don’t know if they’ll also ask you to provide payslips. Good luck.